Taking its name from the ancient Sanskrit word ‘upala, meaning ‘precious stone’, this enchanting crystal suggests you may find yourself feeling slightly fragile this week. Well-meaning comments from friends, colleagues and family members may leave you feeling slightly tearful, and you may find yourself feeling very nostalgic too. Nurture your heart and mind - and leave your sadness behind - by holding an Opal by your heart, or placing one by a photo of yourself. Prized for centuries, this stunning crystal is often associated with the Hawaiian Goddess of Fire and Volcanoes, Pele! Like this fearless goddess - who was renowned for her fiery temper - this spellbinding crystal suggests you may find yourself feeling very frustrated with someone around you this week. Attention-seeking behaviour from friends and colleagues may leave you feeling very annoyed, and someone’s diva-ish antics could really test your patience too! With a rich and fascinating history, this enchanting crystal has bewitched the hearts of everyone - from healers and writers, to geologists and jewellers. Symbolising love, healing and connection, it suggests you may find yourself feeling slightly ignored by someone around you this week. Unanswered messages to friends and loved ones may leave you feeling very paranoid, and you may find yourself clashing with a very close-minded person too. This mesmerising crystal was highly revered by the ancient Indians - who lovingly nicknamed the gem ‘ratnaraj’, meaning ‘king of precious stones’. Known as a stone of love and passion, it suggests you could find yourself attracting some very flattering attention this week. Unexpected messages from ex-partners and childhood friends can also be expected, and you may find yourself feeling very torn between two people around you too. Known as the stone of poets and teachers, this stunning crystal suggests you may find yourself feeling very drawn to a new hobby or skill this week. Empowering conversations with friends, colleagues and loved ones may leave you feeling very inspired, and the bond between you and a friend or colleague could become much closer too. Nurture the bonds around you by holding a Pink Tourmaline by your heart, or placing one by a photo of you and your loved ones. Thought to gently wash away our sorrow and sadness, this enchanting crystal suggests you may find yourself feeling very anxious about the future this week. Worries about finances - and fears about losing your loved ones - may leave you feeling very vulnerable, and you may find yourself feeling slightly overwhelmed by your home and work responsibilities too. Wave your worries goodbye - and keep your spirits high - by keeping a Mookaite nearby. Known as the stone for ‘healing the healer’, this stunning crystal suggests you may find yourself feeling very frustrated with a very stubborn individual around you this week. Rude or petty remarks from friends, colleagues and ‘acquaintances’ may leave you feeling very angry, and you may need to stand your ground with someone around you too. Prevent their negativity from draining your energy by keeping a Prehnite nearby, or placing one under your pillow. Resembling a beautiful, starry sky at night, this mesmerising crystal suggests you may need to help a friend or loved one through a very difficult time this week. Heartbreaking messages from friends, colleagues and family members may leave you feeling very tearful, and someone from the past could surprise you with a very heartfelt apology too. Keep your energy sky high by keeping a Blue Goldstone in your home or work place, or holding one by your heart. Symbolising truth, healing and clarity, this stunning crystal suggests you may see a very different side to someone around you this week. Honest conversations with friends, partners and potential love interests may leave you feeling slightly unsettled, and someone you love could surprise you with a shocking revelation about their past too. Keep your energy high by placing a Clear Quartz in your home or work place, or simply keeping one with you each day. Known as the ‘stone of domestic bliss’, this enchanting crystal suggests a friend or family member could surprise you with their generosity this week. Heartwarming gestures from friends, colleagues and loved ones - and kind words from people you meet - may leave you feeling slightly emotional, and someone very special from the past could re-enter your life too. Celebrate all the love and happiness around you by keeping an Emerald in your home, or holding one by your heart. Prized for centuries, this mesmerising crystal symbolises the light at the end of a very dark - and difficult - time in your life. New jobs, friendships and relationships can all be expected, and the bond between you and a family member could become much stronger too. Leave the past behind you - and embrace all the joy and happiness coming to you - by keeping a Sapphire in your home, or placing one beside a photo of you and your loved ones. 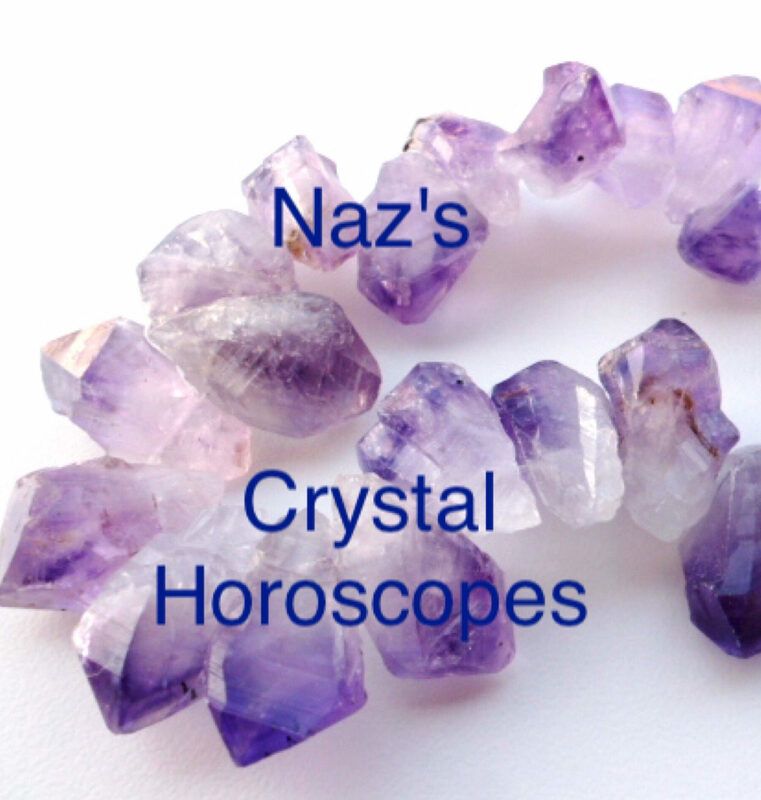 Synonymous with inner-peace and healing, this enchanting crystal is thought to help with everything - from boosting your confidence and protecting your family, to enhancing your creativity and making you happy! Known as a stone of wisdom, it suggests you may find yourself feeling slightly drained by your work life this week. Calm your heart and mind by keeping a Chalcedony in your home or work place, or holding one by your heart each night.